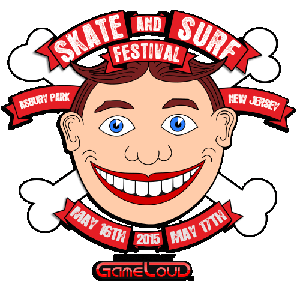 The Skate and Surf Festival 2015 at the Asbury Park oceanfront May 16 to 17 is expected to bring about 10,000 people each day into the city. “So residents should be aware that there may be some parking and traffic issues,” city Director of Commerce Tom Gilmour said at Monday’s City Council workshop. The Skate and Surf Festival is taking place this Saturday and Sunday, May 16 and 17 at Bradley Park and Ocean Avenue. The festival is a multi-day, youth culture event that combines music, competitive gaming, skateboarding and surfing. “I think it’s going to be great. It will bring in national acts and anything that brings people into town- we love it,” said Carrie Turner, director of retail for boardwalk redeveloper Madison Marquette. “There is no reentry into the festival so once you are in- you are in. But I still think it’s a great opportunity for local businesses. Many people will be taking the train and walking down Cookman Avenue so they will see the city and perhaps want to come back. Business may not be immediate on those two days but it is always good to bring people into town,” she said. And Chamber of Commerce Executive Director Jackie Pappas agrees. “I think it will be a fun weekend and brings a great energy to the boardwalk and city. It’s nice to see the city and event producers all working together to make sure it’s a fun and safe weekend,” she said. And Pappas said she, too, believes that any events that bring people into Asbury Park are a good thing. “It brings a new audience to see what Asbury Park has to offer and can have a long-term benefit. It is still a little early in the beach season so it’s good for the boardwalk and the whole city,” she said. Tickets for the Skate and Surf Festival are available online and at some local Asbury Park businesses. The festival is held rain or shine and single- and two-day passes are available at www.skateandsurffest.com- as is more information. The bands the Boston Ragers Dropkick Murphys will close Saturday’s main stage and New Brunswick alt-rockers The Gaslight Anthem will headline on Sunday. The Front Bottoms, from Woodcliff Lake will be playing the main stage and Major League, from Mullica Hill, The Parlor Mob, from Red Bank, and The Scandals, from Bayonne are a few of the new jersey-based bands playing on the festivals four stages. Other bands include Thrice, Philadelphia-based pop-punk favorites The Wonder Years, and Atlanta’s Manchester Orchestra.